Wyoming’s first discovery of uranium in 1918 in the tailings of an abandoned silver mine near Lusk was only a curiosity. It was not until after WWII, at the start of the cold war, that uranium became of interest. The Atomic Energy Commission offered incentives and guaranteed price for uranium in 1948. But it was geologists Dave Love discovery at Pumpkin Buttes in 1951 that ignited the Wyoming uranium boom. Wyoming has the largest known deposits of uranium ore in the United States. The state has produced over a quarter billion pounds of uranium ore (U3O8, “yellowcake,” mill concentrated uranium) since the 1950s. Wyoming’s three active plants produce 81% of the nation’s uranium. Wyoming uranium has produced the energy equivalent of 5.9 billion barrels of oil and 1.8 billion tons of coal. East aerial view of Gas Hills-Crooks Gap Uranium Mining Districts area. Faults shown by red lines, sawteeth are thrust faults and stick and ball are normal faults. Abbreviations: GDB: Great Divide Basin, PRB: Powder River basin, SB: Shirley Basin, WRB: Wind River Basin. Like most of Wyoming’s extractive mining industries, uranium has experienced boom-bust cycles. The industry is dependent on two factors, resource base and the market. Since Wyoming holds the largest volume of uranium reserves in the country, market swings drive the price of uranium, uranium production volume, and employment in the state. Image: Wilson, A.B., 2014, Uranium in the Wyoming Landscape Conservation Initiative Study Area, Southwestern Wyoming: U.S. Geological Survey Open File Report 2014-1123, Fig. 1, p. 2; https://pubs.usgs.gov/of/2014/1123/pdf/ofr20141123.pdf. Uranium concentrate price 1968-2017. Events that resulted in an increase in price (green labels) and decrease in price (red label) are shown. Image: After Energy Fuels Inc., 2018, U.S. Security and Exchange Commission Form 10-K, Fiscal Year ending 12/31/2017; https://www.sec.gov/Archives/edgar/data/1385849/000138584918000018/efr-20171231x10k.htm. The area that would become Jeffrey City began as a 640-acre homestead in 1931. A World War I veteran and his wife farmed the land south of the Sweetwater River. When the highway was built in 1941, they gave up farming and opened a gas station to service passing vehicles. The wife prepared food for the travelers in her kitchen. When the Post Office closed at Split Rock in 1943, she took care of the local rancher’s mail. In the early 1950’s she applied for and received a Post Office that she named Home on the Range. ​Commercial quantities of uranium were discovered nearby in 1954. Mining began in 1955 and a contract with the Atomic Energy Commission to supply uranium was obtained in 1957. The contract required housing be supplied for the workers and so a 150-person trailer park community was established that was named Jeffrey City. This irritated the Home on the Range Postmistress, who would return mail not addressed to Home on the Range. Jeffrey City continued to expand, reaching a population of 4,000 people. New businesses and organizations came to town including a bank, bowling alley, library, Little League baseball, Boy Scouts, a newspaper, two restaurants, a motel, a shooting club, homemakers club, several fraternal organizations, and seven churches. A volunteer fire department, an emergency medical clinic and one sheriff and two deputies maintained the safety and health of the citizens. The state awarded the town its own school district in 1977. Two years later they had constructed a new grade school, junior high, and high school. A gymnasium was built in 1982. They even had a hamburger place for the kids to hang out. And then the uranium bubble burst. Energy conservation and Three Mile Island made ripples that sent the product price tumbling. A Series of layoffs and then a mine closure sealed the town’s fate. By 1982, 95 percent of the population had left. Today Jeffrey City is all but a ghost town. Jeffrey City in good times, winter of 1979-1980. Image: Amundson, M.A., 1995, Home on the Range No More: The Boom and Bust of a Wyoming Uranium Town, 1957-1988: Western Historical Quarterly, p. 489. Jeffrey City in not so good times, 1992. Most of Wyoming’s uranium occurs in coarse-grained arkosic sandstone deposits. The Wind River Formation is the host rock at Gas Hills and the Battle Spring Formation is the host at Crooks Gap. The formations are similar in lithology, composition, texture and are approximately time equivalent (early to middle Eocene, 37-55 million years old). The granitic debris is evidence of exposure of the Granite Mountains core during deposition. dominant structure in the area is the Granite Mountains. It is bound on the south- southwest by the Emigrant Trail Thrust. The Eocene was the time of maximum movement. The mountain range has a unique history and surface geology due to its collapse about six million years ago (see https://www.geowyo.com/granite-mountains.html). Green Mountain and Crooks Gap Peak consist of preserved Eocene strata that were shed from the former Granite Mountains Uplift and now have a higher elevation. The granitic core of the range is the sediment source for the Wind River (north), Battle Spring Formations and Crooks Gap Conglomerate (south). Both were deposited by humid alluvial fans and streams flowing from the mountains. Radioactive material commonly occurs in nature and is called NORM (naturally occurring radioactive material or TENORM, technically enhanced radioactive material). Most rock and soils contain between 0.5-5 picocuries per gram (pCi/g) of radium-226. Norm concentraions can increase in oil field chloride rich waters producing a scale on equipment. Measurements in Wyoming indicate that NORM and TENORM are at background levels or marginally detectable. NORM radiation levels from oil field equipment in continental United States. Image: After Zelinski, R.A., and Otton, J.K., 1999, Naturally Occurring Radioactive Materials (NORM) in Produced Water and Oil-Field Equipment an Issue for the Energy Industry: U.S. Geological Survey Fact Sheet FS-249-99; https://pubs.usgs.gov/fs/1999/0142/report.pdf. ​The uranium ore in the Eocene formations are developed in roll front deposits in the Wind River and Battle Spring Formations. Roll fronts are created by oxidized uranium-bearing surface and ground water moving through the beds depositing minerals when a reducing zone is encountered. 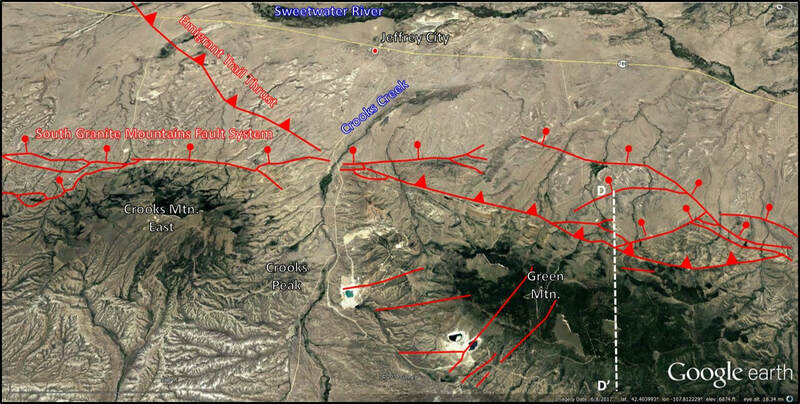 Reconstruction of Early Eocene paleogeography and paleodrainage pattern in Wyoming. Mining Districts shown in yellow. Altered sands associated with roll front deposits shown in light brown. 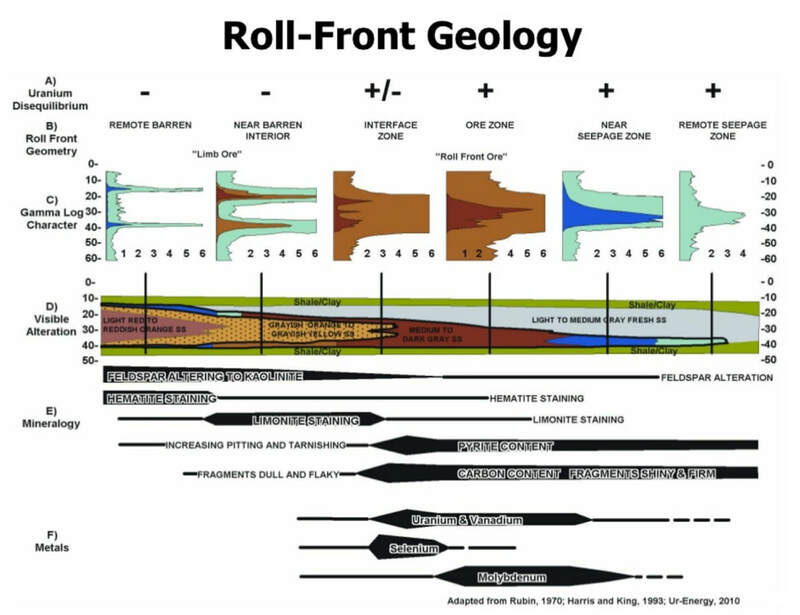 Image: Base: Blakey, R., 2011, Paleogeography of Western North America DVD; Data: Boberg, W.W. 2012, The Wyoming Uranium Province: A Case Study on the Origins of Sandstone Uranium Deposits; https://www.slideshare.net/monatom/03-boberg-2012-iaea-wy-uranium-province. Model for roll front development. 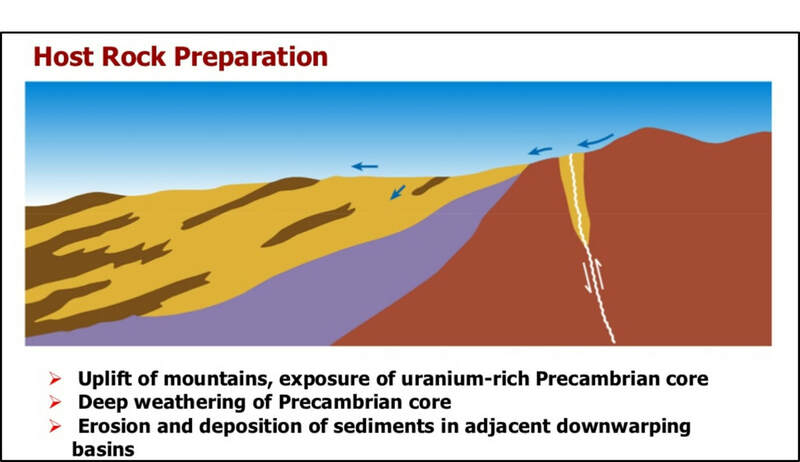 Image: Boberg, W.W. 2012, The Wyoming Uranium Province: A Case Study on the Origins of Sandstone Uranium Deposits, Slide 5; https://www.slideshare.net/monatom/03-boberg-2012-iaea-wy-uranium-province. 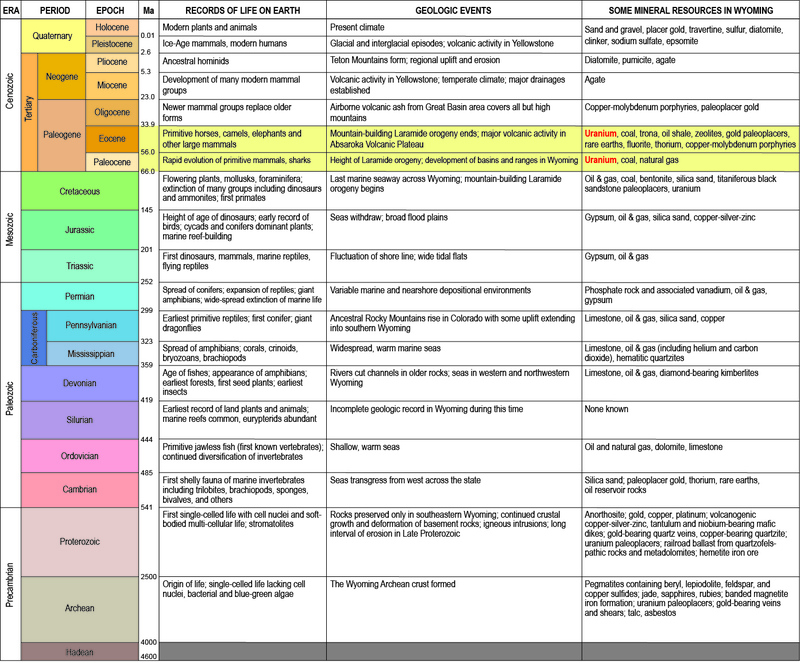 General stratigraphy of the Wyoming Uranium Province. 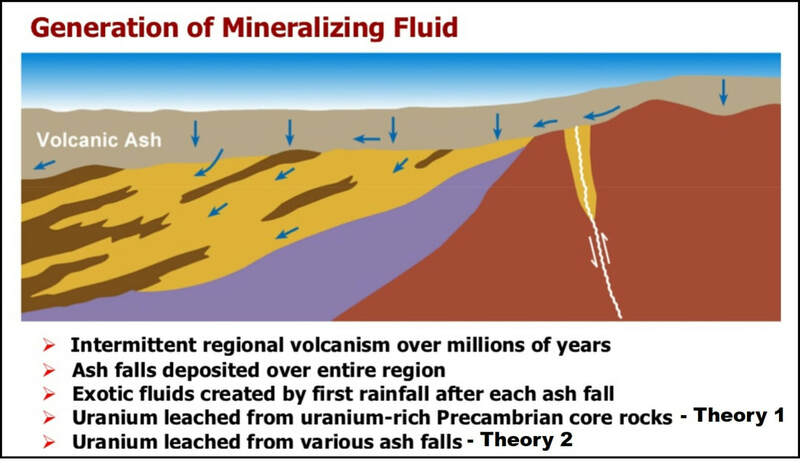 ​Two theories are proposed about the original source of uranium: Precambrian granitic rocks or rhyolitic ash deposits from the overlying White River Formation. The large volume of clastic granitic sediment from the Granite Mountains are deposited in the Battle Spring and Wind River Formation. The average uranium content of the mountains is 2-3 times (8.6-11.5 ppm) the average Wyoming background uranium level (1.8 ppm by weight). The uranium was distributed within the arkosic sandstones. Almost 500 feet of ash covered Wyoming over the 45 million years of active volcanism. Leaching of uranium from one major ash fall by oxidized water could generate 150,000 million pounds of U3O8 uranium to the arkosic host rock. Carbonaceous material would create reducing conditions in the host rock to form a roll front. The oxidized waters could mobilize uranium contained in the arkose at the same time. The formation of ore deposits (red). Gas Hills District Wyoming Open Pit Uranium Mining Mine Old Vintage Postcard A63. ​Uranium was discovered in the Gas Hills at Section 21, Township 33 North, Range 90 West on September 1953. The ore is found in sandstones at the surface to a depth of 450 feet. Tertiary beds in the area dip from 2 to 6 degrees south. Roll fronts are found in the Lower Eocene Wind River Formation. Mining operations began with the opening of the Lucky Mc (pronounced Mack) mine in 1955. 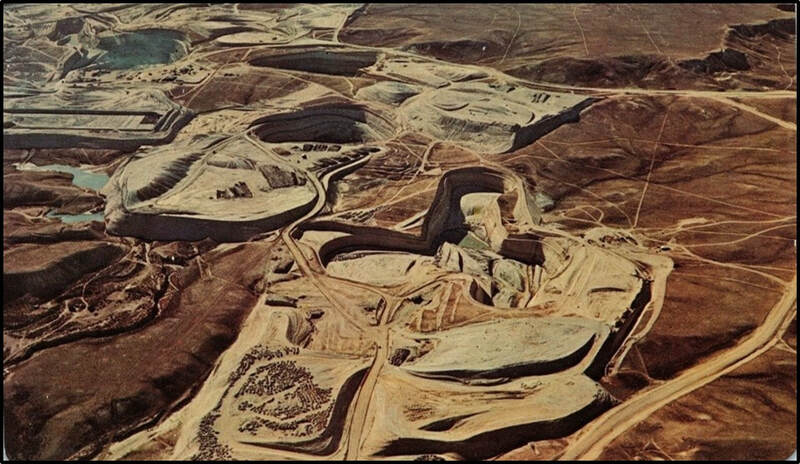 Uranium ore was extracted by conventional techniques, mostly by open pit although some underground mines existed. Conventional mining ceased in 1988. The rapid decline in uranium price in the 1980s was the primary cause for the production halt. The Gas Hills District produced about 100 million pounds of uranium from 24 mines (CAM, 2012, National Instrument 43-101 Technical Report Update of Gas Hills Uranium Project Fremont and Natrona Counties, Wyoming, USA and WSGS, 2010, Map Series 94). In 2017, BSR Incorporated completed a report titled “Amended and Restated, Gas Hills Uranium Project, Mineral Resources and Exploration Target NI 43-101 Technical Report, Fremont and Natrona Counties, Wyoming, USA.” The report identifies five areas of mineralization for exploration with an estimated 4.7-million-pound resource target and an upside inferred resource of an additional 2.5 million pounds of ore. They propose an in-situ recovery process (ISR) for ore extraction. This technology (aka in-situ leaching (ISL) or solution mining) was developed to extract uranium from roll front type deposits in the mid-1960s. Leaching solution is pumped into the formation to contact the ore via a well and then pumped back to the surface through a recovery well. It is considered environmentally friendly due to little surface disturbance and no mine tailings. Azarga Uranium purchased Energy Fuels leases in the Gas Hills Project in 2016. Ur Energy purchased Pathfinder Mines in 2013 and is planning an ISR project at the Lucky Mc mine leases. Gas Hills District roll front trends developed in fluvial channel deposits. 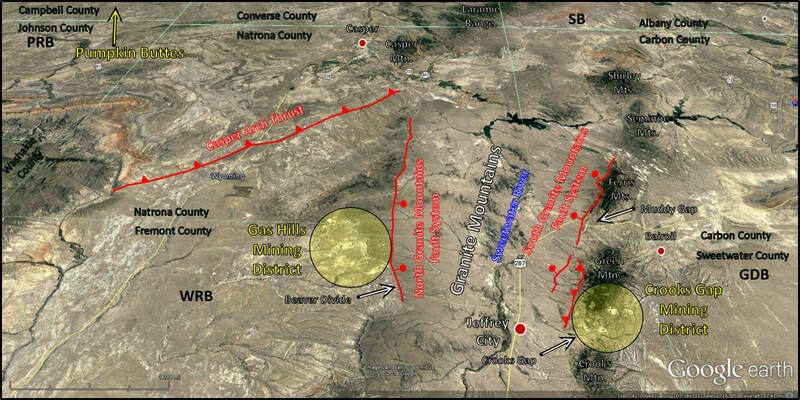 Image: CAM, 2012, National 43-101 Instrument Technical Report Update of Gas Hills Uranium Project Fremont and Natrona Counties, Wyoming, USA, Fig. 7-9, p. 50; http://www.energyfuels.com/wp-content/uploads/2016/04/Gas_Hills_Technical-Report_March_22_2013.pdf. Geologic map of the Gas Hills Area. Areas of surface disturbance from open pit mining shown in light yellow. Image: Left: Soister, P.E., 1967, Geology of the Puddle Springs quadrangle, Fremont County, Wyoming: U.S. Geological Survey, Bulletin B-1242-C, scale 1:24,000; https://ngmdb.usgs.gov/ngm-bin/pdp/zui_viewer.pl?id=6597; Right: Gregory, R.W., and Broes, L.D., 2018, Preliminary geologic map of the Gas Hills quadrangle, Fremont and Natrona counties, Wyoming: Wyoming State Geological Survey Open File Report 2018-4, scale 1:24,000; http://www.wsgs.wyo.gov/products/wsgs-2018-ofr-04.pdf. Gas Hills geologic cross sectios AA’ and BB’. Locations shown on index map below. Image: Zeller, H.D., Soister, P.E., and Hyden, H.J.,1955, Progress Report on the Geology and Uranium Deposits of the Gas Hills Area, Fremont and Natrona Counties, Wyoming: U.S. Geological Survey, Technical Elements Investigations Reports 560, Fig. 4, p. 15; https://digital.library.unt.edu/ark:/67531/metadc304641/m1/17/zoom/?resolution=1.5&lat=1048.5&lon=750. Gas Hills detail geologic cross section CC’. Location shown on index map above. Image: Base: Google Earth,; Data: After Zeller, H.D., Soister, P.E., and Hyden, H.J.,1955, Progress Report on the Geology and Uranium Deposits of the Gas Hills Area, Fremont and Natrona Counties, Wyoming: U.S. Geological Survey, Technical Elements Investigations Reports 560, Fig. 4, p. 15; https://digital.library.unt.edu/ark:/67531/metadc304641/m1/17/zoom/?resolution=1.5&lat=1048.5&lon=750. North aerial view of the Crooks Gap Mining District. 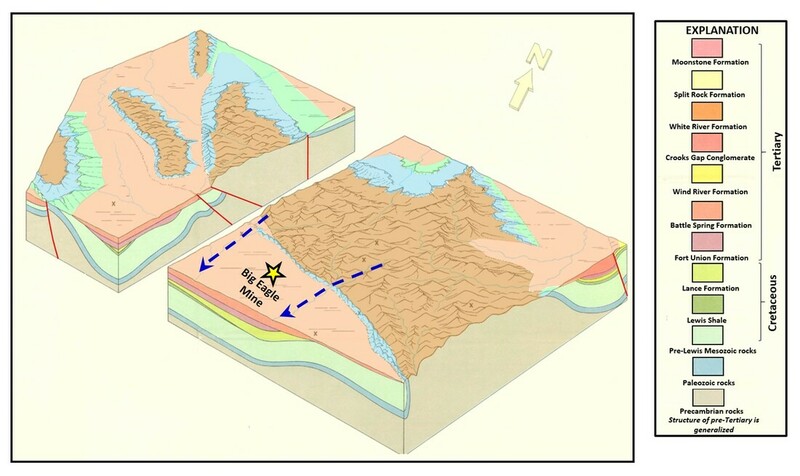 Faults shown by red lines, thrust faults have sawteeth on up thrown block and normal faults have stick and ball on downthrown block. Structural cross section AA’ location is shown by white dashed line. 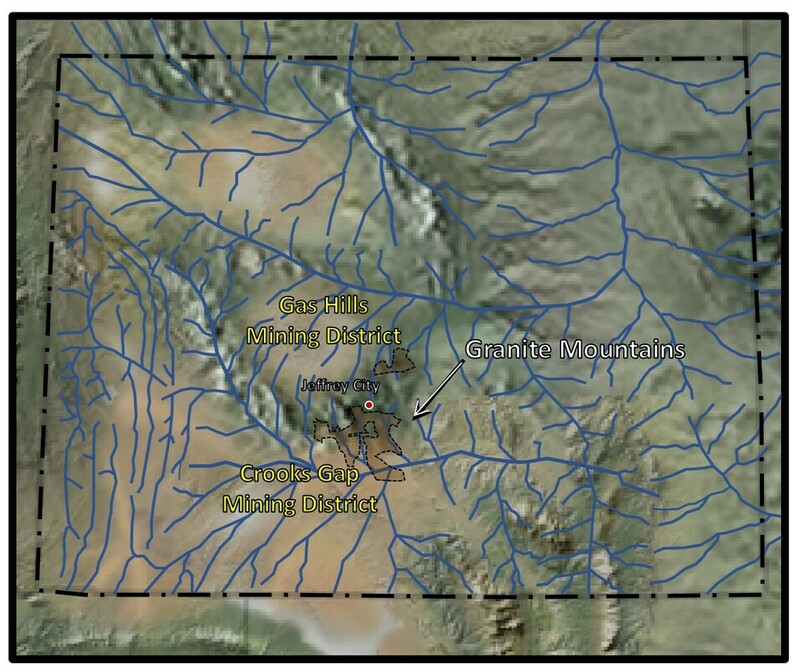 The Big Eagle Mine is the white scar in the lower center with the two ponds. ​Uranium was discovered in Crooks Gap at Section 8, Township 28 North, Range 92 West in December 1953. The discovery was found on the fault plane exposures of the Emigrant Trail Thrust in contact with Cambrian Gros Ventre Shale. Commercial volumes were discovered by Bob Anderson, who attached radiation detectors to the wings of his private plane and found uranium in Crooks Gap. He formed Lost Creek Oil and Uranium Company to mine the discovery. He built the first uranium mill in the state at Split Rock and received an Atomic Energy Commission uranium purchase contract in 1957. The contract required housing be provided for the mine workers and so a 150-person trailer park was built and named Jeffrey City after one of his financial backers. The company’s name was changed to Western Nuclear. They actively mined Crooks Gap from 1956 to 1982. The Battle Spring Formation ore bodies are controlled by permeable sands with abundant carbonaceous debris. They were deposited within major stream channels that flowed southward into the Great Divide Basin. Classic roll front ore bodies form when uranium bearing oxidized water encounters the reducing environment of the carbonaceous debris. 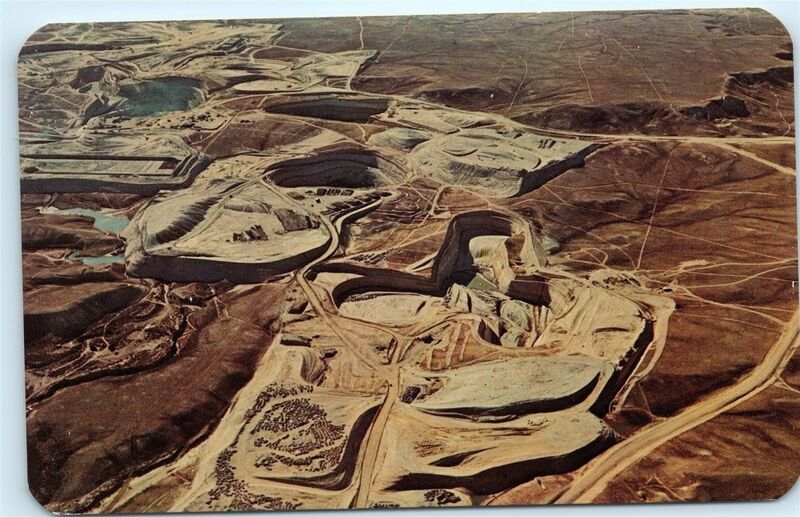 Pathfinder Incorporated initiated the Big Eagle open pit mine in 1977. 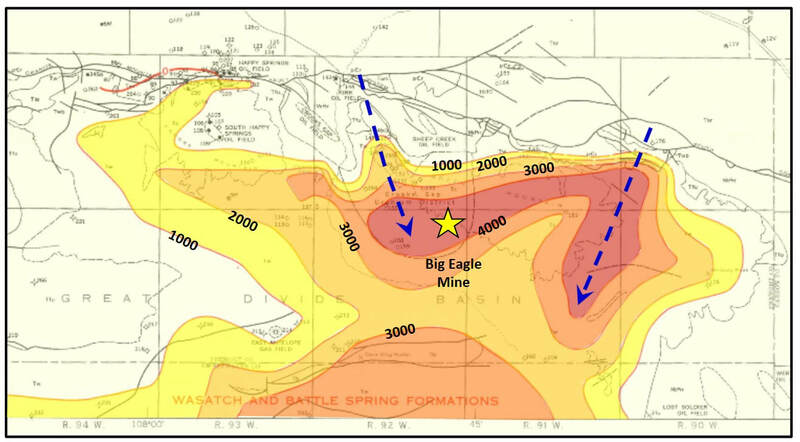 The mineralization at Big Eagle differs from the other accumulations in the district. Here the ore is formed in stratiform deposits with structural control. Regional dip is 1 to 3 degrees NE, a reversal from depositional dip. Mineralization occurs near fault surfaces. The mine ceased operation in 1989. The Crooks Gap District produced about 4.8 million short tons of ore (not yellowcake) from conventional mining of seven mines (WSGS,2010, Map Series 94). Big Eagle open pit mine. Reconstruction of the of Battle Spring depositional setting. Paleodrainages of alluvial system shown by dashed blue lines. Approximate location of Big Eagle Mine displayed with yellow star. Image: After Love, J.D., 1970, Cenozoic Geology of the Granite Mountain Area, Central Wyoming: U.S. Geological Survey Professional Paper 495-C, Plate 10, Figure E; https://pubs.er.usgs.gov/publication/pp495C. Battle Spring Formation thickness map. Contour interval in feet. Paleodrainages of alluvial system shown by dashed blue lines. Approximate location of Big Eagle Mine displayed with yellow star. 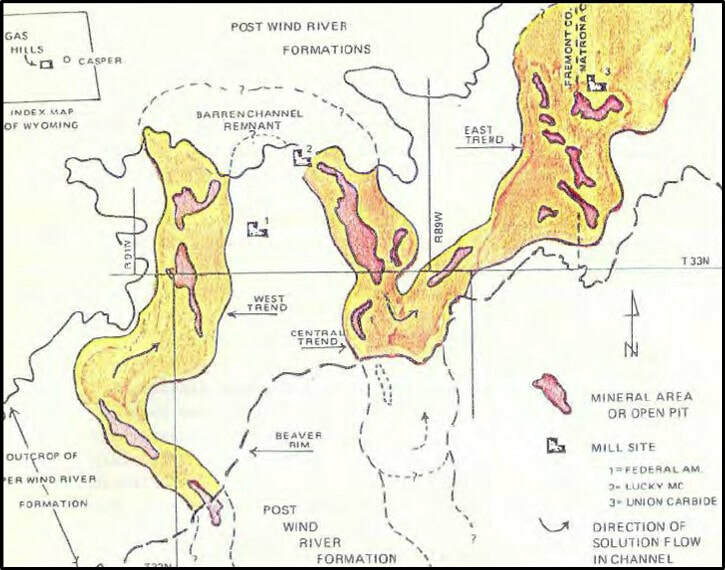 Image: After Love, J.D., 1970, Cenozoic Geology of the Granite Mountain Area, Central Wyoming: U.S. Geological Survey Professional Paper 495-C, Plate 5, Map B; https://pubs.er.usgs.gov/publication/pp495C. Geologic map of the Crooks Gap Area. Areas of surface disturbance from open pit mining shown in light yellow. Green Mountain cross section DD’. Location shown on the Crooks Gap Mining District aerial image. Image: Dahlkamp, F.J., 2010, Chapter 2, Wyoming Basins in Uranium Deposits of the World: USA and Latin America, Fig. 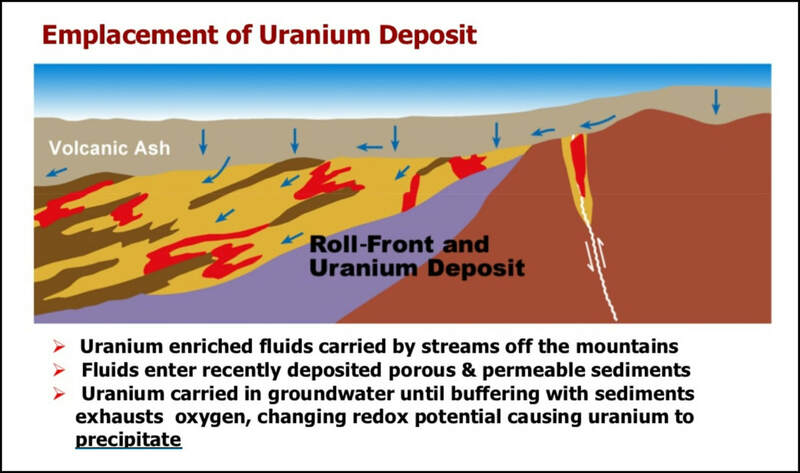 2.19, p. 184; https://fac.ksu.edu.sa/sites/default/files/ebooksclub.org__Uranium_Deposits_of_the_World__USA__and_Latin_America.pdf. ​Today all uranium mining in Wyoming is done by the in-situ process. A series of wells are drilled for injection and recovery of the ore. A solution composed of oxygenated water and sodium carbonate (e.g. baking soda) called lixiviant is pumped down a wellbore, dissolves uranium and returned to the surface for extraction of the ore. The heyday of conventional uranium mines and miners is over. They have disappeared into Wyoming’s history just as Jeffrey City and Home on the Range before them. 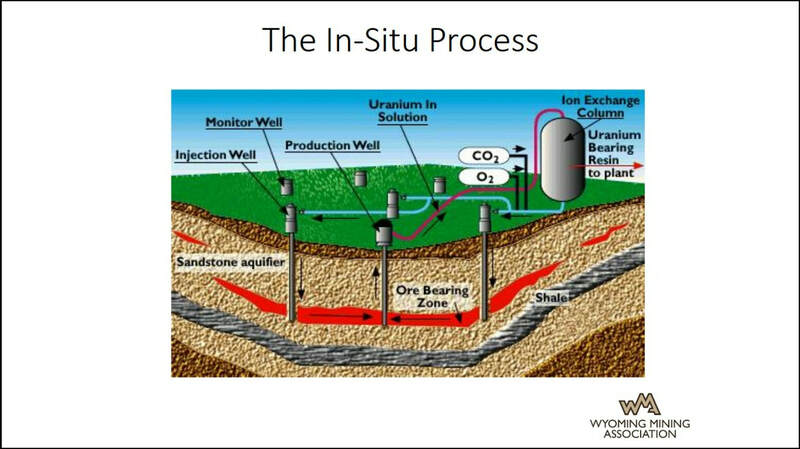 Diagram of the in-situ process. Image: Wyoming Mining Association, 2017, Wyoming Uranium: An Overview, Slide 13; http://www.wyomingmining.org/wp-content/uploads/2018/01/170626-Wyoming-Uranium-Overview.pdf.